Scotts® STEP®1 Crabgrass Preventer Plus Lawn Food can improve a lawn's ability to absorb water & nutrients. Apply in early spring for a fast green-up after winter. It also controls crabgrass for up to 4 months! 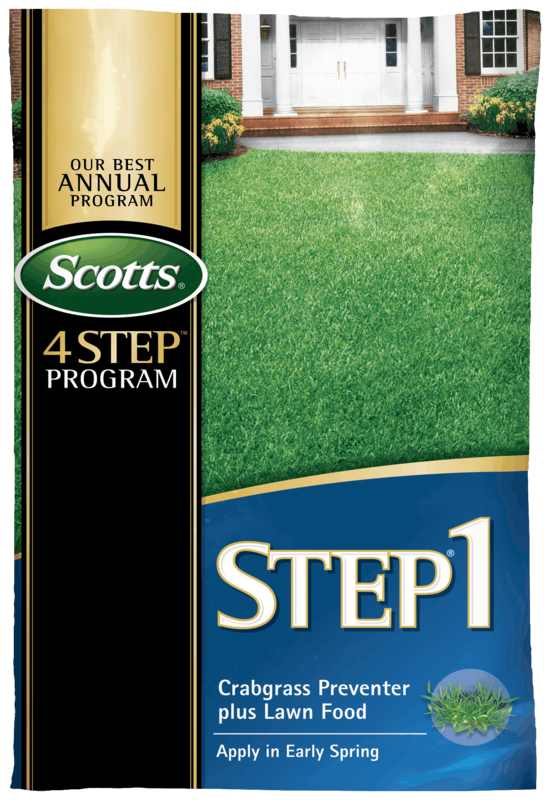 Utilize the entire Scotts® 4 Step program for a better lawn. 5,000 sq. ft. and 15,000 sq. ft. Apply when grass is dry. Set spreader: See spreader settings above for the appropriate setting for your spreader. For best results, use a Scotts® spreader. Product does not need to be watered in, but for best results, the lawn should receive 1/4 to 1/2 inch of water from rainfall or watering within 2-3 days after application. Not for use on Dichondra or bentgrass lawns. Do not use on lawns within 4 months of seeding or sodding as product will prevent grass seed from sprouting. Do not apply more than twice in one year. Apply in the early spring before the third or fourth mowing or before temperatures are regularly in the 80s. Prevents crabgrass all season. Feeds and greens up after winter. CAUTION: Harmful if absorbed through the skin. Causes moderate eye irritation. Avoid contact with eyes, skin, or clothing. User should wash hands before eating, drinking, chewing gum, using tobacco, or using the toilet. User should remove clothing immediately if pesticide gets inside. Then wash thoroughly and put on clean clothing. If in eyes: Hold eye open and rinse slowly and gently with water for 15-20 minutes. Remove contact lenses, if present, after first 5 minutes, then continue rinsing eye. If inhaled: Move person to fresh air. If person is not breathing, call 911 or an ambulance, then give artificial respiration, preferably by mouth-to-mouth, if possible. Call a poison control center or doctor for treatment advice. Have the product container or label with you when calling poison control center or doctor, or going for treatment. This pesticide is toxic to fish. Runoff from treated areas may be hazardous to aquatic organisms in neighboring areas. To protect the environment, do not allow pesticide to enter or run off into storm drains, drainage ditches, gutters or surface waters. Applying this product in calm weather when rain is not predicted for the next 24 hours will help to ensure that wind or rain does not blow or wash pesticide off the treatment area. Sweeping any product that lands on a driveway, sidewalk, or street, back onto the treated area of the lawn or garden will help to prevent run off to water bodies or drainage systems. In case of spills, either collect for use or dispose of properly. Staining Note: Can cause staining to cement, stone, metallic surfaces (such as automobiles and garden furniture), clothing or shoes. If contact occurs, brush off particles to prevent staining and / or unwanted tracking into the house. If necessary, rinse off with water. Broadcast spreader with exclusive EdgeGuard® technology. Holds enough Scotts lawn product to cover 15,000 sq. ft.